These birds are very sociable and nest close together in large colonies. They have developed a lot of different courtship and pair-bonding displays that the pairs use to say that they belong to each other. The birds hardly ever fight, even though they are so near to each other. Instead, they have displays that tell close-by birds to keep their distance. 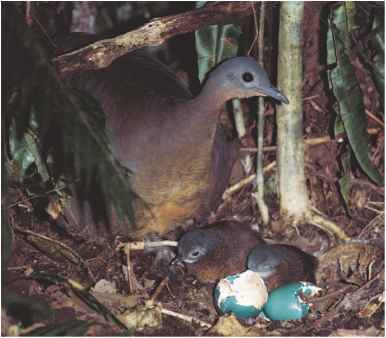 Almost all of these birds lay their eggs right on the ground. The two booby species that use trees and bushes build stick nests. Most of these birds lay only one egg. A few lay two or three, but sometimes only one survives. The parents take turns keeping the eggs warm by wrapping their webbed feet around them, and both of them care for the chicks until they are on their own.